How much would you like to know what your customers are up to and what kind of nudge they need to convert? Your past data holds answers to likely future outcomes, and predictive intelligence helps you unlock those. While the concept of advanced forecasting isn’t new – the airline industry has been analysing their flight data for years to minimise late arrivals and optimise routes – it is now starting to reach its full potential in the marketing industry. So far in this series, we’ve looked at how to get your data ready and descriptive v diagnostic analytics. In this third and final chapter, we explain what exactly you can achieve with a mature big data analytics setup. Predictive analytics transforms all the scattered knowledge you have relating to how and why something happened into models, suggesting future actions. 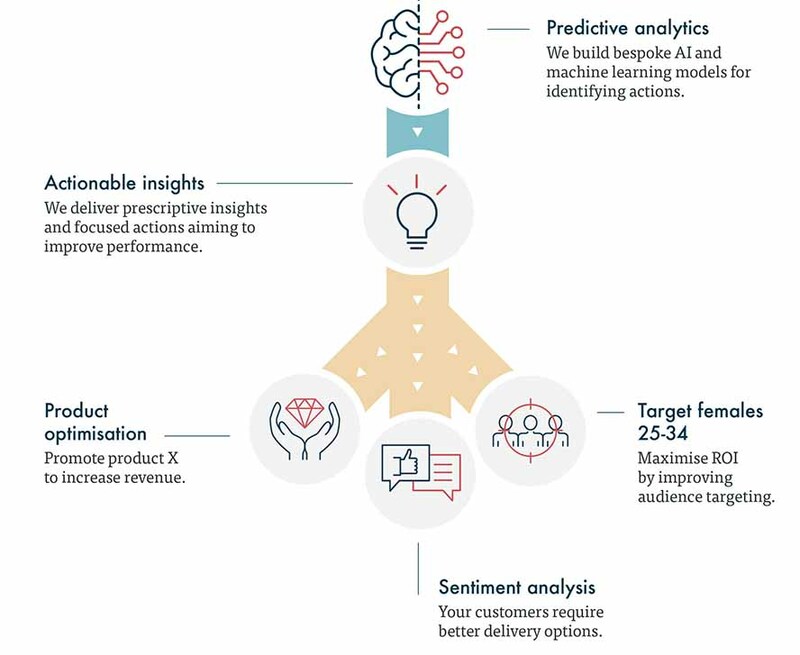 By integrating various techniques including data mining, modelling, machine learning (ML) and artificial intelligence (AI), predictive analytics tools transform the data at hand into focused marketing action. While descriptive analytics helps us learn more about the past, predictive analytics looks into the future, answering the “What will happen if…” questions. Predictive algorithms tell you about the likelihood of a future outcome with scientific accuracy. Big data is a collection of moving parts that can be smartly mixed and matched to model hundreds of different outcomes (negative and positive) that will guide your decision making. Predictive intelligence can be applied to back up all sorts of marketing decisions, depending on your targeted area for improvements. Econsultancy’s 2018 Email Census indicates that 58% of marketers were either using or considering using predictive techniques to improve the content of their emails. Specifically, behaviour-based personalisation has become the key area where predictive analytics is making the most impact. 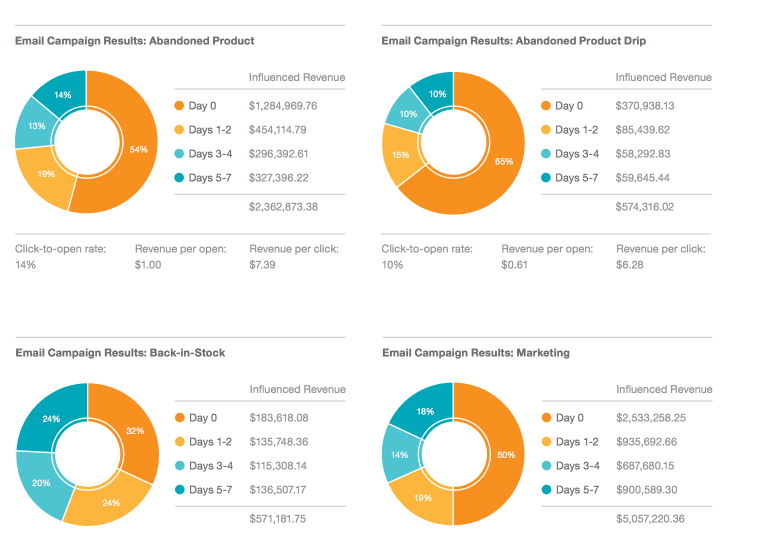 Intelligent email marketing campaigns tend to generate the highest influenced revenue – $5,1 million. Predictive analytics allows you to build an intimate rapport with individual customers, rather than large segments. By analysing customers’ historic purchases, demographics and behaviour data, algorithms can suggest when to send follow-up and reactivation emails, what content to include, how to re-engage your customers at the most effective cost and what product recommendations and promo offers to dispatch. Predictive analytics adds a scientific dimension to determining similar groups of customers and similar segments in new markets. Your sales teams can pinpoint valuable prospects earlier in buyers’ journeys, prioritise the most valuable accounts for expansion and uncover new prospects that most closely resemble existing customers. Determine what types of content generate the most impact for certain leads and prospects. Predictive analytics allows you to optimise and personalise your content distribution so that each prospect receives the optimal message at the right time. Instead of second-guessing what to send to new prospects, the algorithms will indicate how certain copy will impact customers of certain demographics or behavioural backgrounds, and programmatically distribute relevant content to them, leading to higher conversions. Estimate the likely lifetime value of new customers by benchmarking them against similar prospects in your system. Similarly, you can predict the likelihood of churn for certain customers. Once your system registers the warning signs, your sales team receives a notification and can take proactive action. Or you can programmatically plug the dangling customer into a personalised churn-prevention campaign. Fine-tuned predictive analytics systems can programmatically streamline all your marketing activities; prioritising the best course of action, launching, pausing and adjusting campaigns depending on their performance, continuously optimising your content distribution and directing you towards untapped opportunities. All your decisions will be backed by data and science, not assumptions and guesswork, diminishing the risks and increasing the ROI of all your actions. Prescriptive analytics is an emerging area of analysis that leverages both existing data and action/feedback data to guide the decision maker towards a desired outcome. Prescriptive analytics is also predictive in nature since it tries to estimate multiple futures based on your actions and advise on the outcomes before you actually make a decision. The best example of prescriptive analytics in action is Google’s self-driving cars. The algorithms powering them make millions of predictions during each trip, deciding when, how and how fast the car should move to reach the destination – the same way a human driver does. Advances in AI, computational modelling, machine learning and reinforcement learning (a sub-division of ML) are bringing prescriptive analytics into the marketing realm. Most businesses, however, are yet to embrace prescriptive analytics solutions (or one of their components such as AI) to guide their daily operations. You are more than encouraged to join the progressive AI party as well. The use cases and benefits of prescriptive analytics for marketing will only expand over the next few years. For sales, prescriptive analytics can help determine the optimal product configurations (premium, high-end, medium and low price offers) by dynamically optimising service prices depending on customers’ tolerances, preferences and other external factors (e.g. availability, demand). Your teams can know exactly what prospects to call to meet sales targets and what kind of offer to pitch to them. For marketers, prescriptive analytics can provide a wide-angle view of all marketing activities, help determine the performance of planned campaigns/content type and estimate how different external/internal factors will impact their planned strategies. Machine learning alone is already experiencing transformational momentum in the marketing realm. 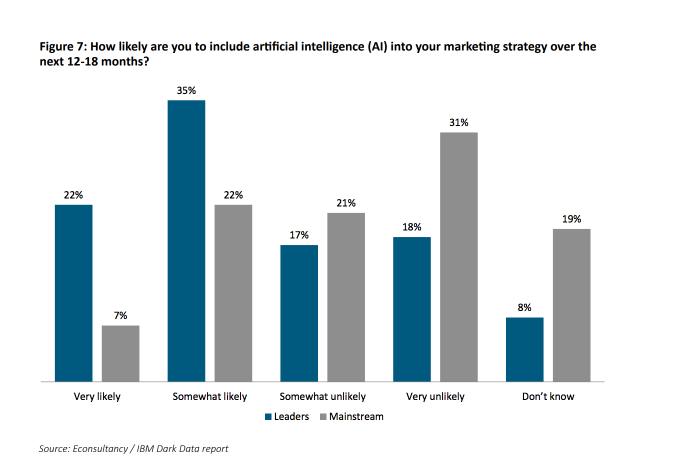 And if you want to know where AI and ML are headed in the future and how these technologies can give you a competitive edge today, download our guide for marketers. Your transformations should start with accumulating and assessing your current data. How much data are we we talking about? Typically, a few thousand records showing both positive and negative outcomes should be sufficient to create marketing, sales or product prediction models. All of your data sets will have to be stitched together in one major data lake. Additionally, you will want to connect some external data streams to it, if your goal is to deploy advanced marketing campaigns based on seasonality, weather, location and so on. 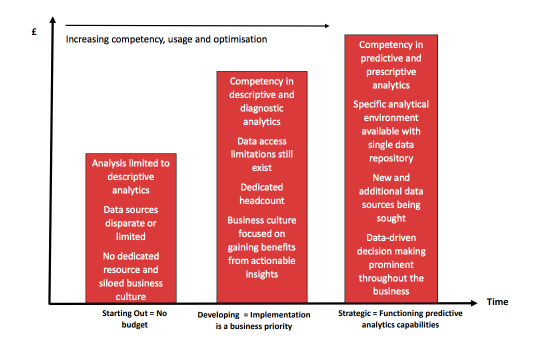 Plug your data to a predictive analytics tool and fine-tune the models yourself. Sign up with a data science vendor to create models, algorithms and data visualisations for you. In both cases, the quality of your data will be crucial for success. 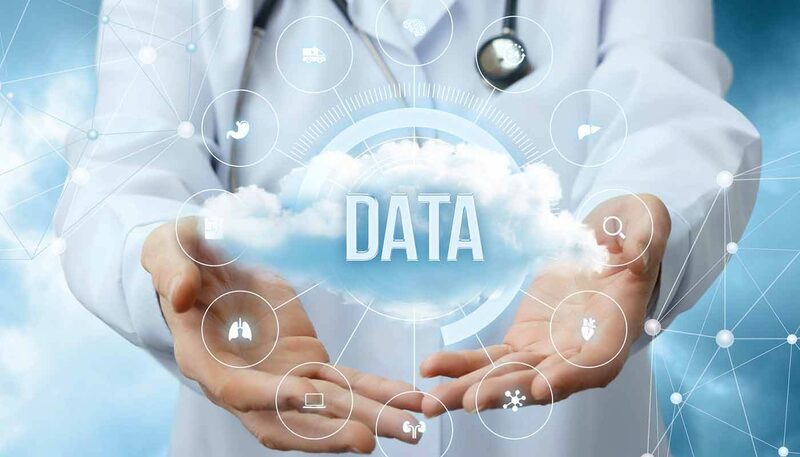 Investment in big data and data analytics can seem steep, but making data-driven decisions makes strong commercial sense as we have illustrated over the course of this three part series. Did you miss parts 1 and 2? George has worked in eCommerce and digital marketing across many industries. Before joining Vertical Leap, he was the Marketing Director for his own company, creating and optimising websites for companies all over Europe. He has a passionate interest in data analytics, data science and machine learning. Data science – it’s the talk of the town for certain. Do you need to invest in data science Here are five signs indicating that it may be time to do so.